Many know me for my involvement in science and art. However, in my free time, sometimes I unwind and socialize with the world's best trading card game, Magic: The Gathering. Magic is a game where two or more players, each representing a special kind of wizard, called a planeswalker, duel, using spells, which are represented on trading cards. The thing about Magic that I love the most is every player has his or her own deck and cards. Since there are literally thousands of different cards, decks vary greatly. Your deck is unique, like you. Every card in there was hand-picked by you. (Unless you are one of those who copies the "top tier" decks from the internet.) 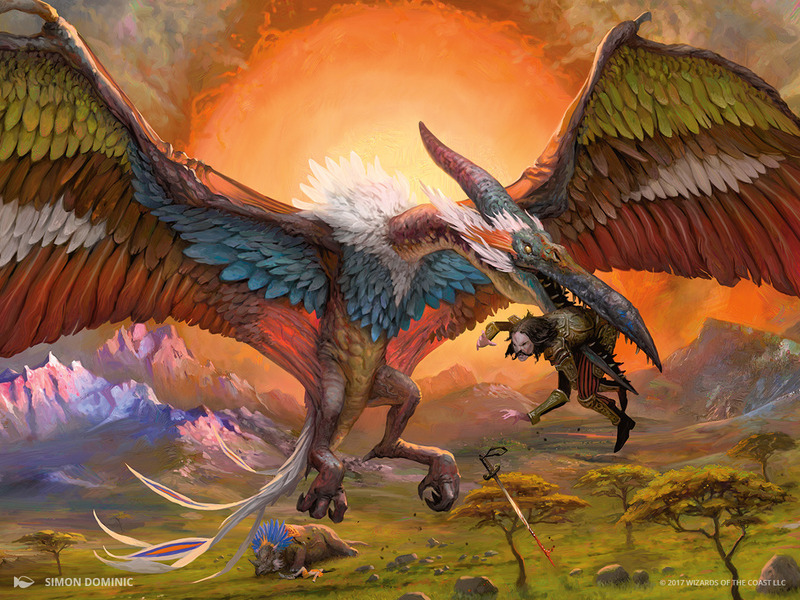 A Magic deck is in many ways an extension of its owner, and every game played is a unique and personal experience for players. I find that beautiful. So what does this all have to do with paleontology? Stay with me! I'll get there! The most common way to attack your opponent in Magic is to summon creatures to attack him/her for you. 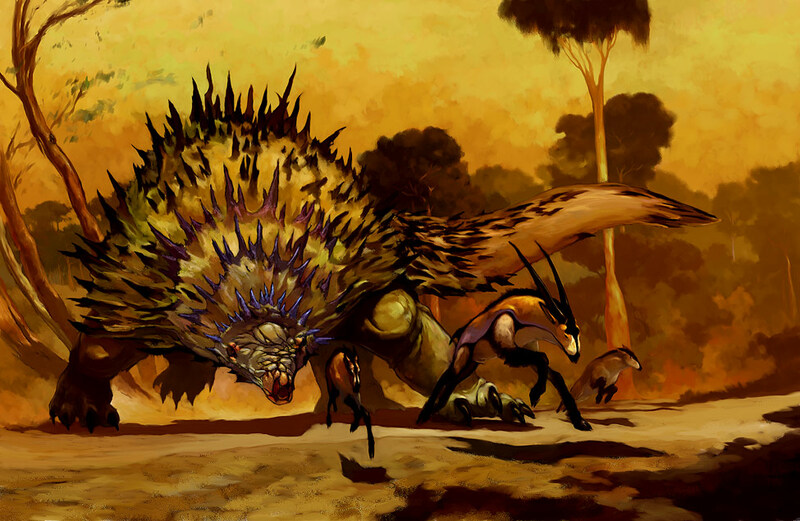 Being a fantasy game, you can expect to see creatures like dragons, elves, goblins, in addition to lots of lesser known, and even some creature types that are unique to the game. 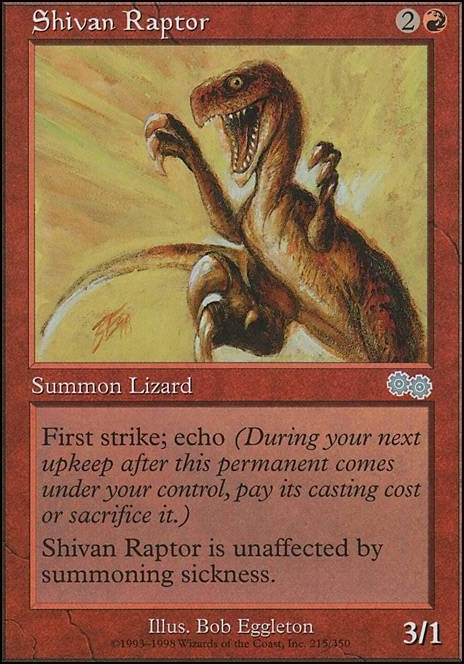 One thing that always bothered me was the fact that there were so few dinosaurs in magic. Only two, to be exact. To add insult to injury, some time later, the two dinosaurs that did exist, were officially changed to be considered "lizards" to help the continuity of the game. From that point on every so often a creature was released that was clearly based on a dinosaur, but the typing (which is important sometimes in Magic because rules and effects will be based on "creature type") would always be "lizard" or sometimes "beast". Pygmy Allosaurus was the only dinosaur card in existence for a long time. The two-fingered hands, curled lip, and arctic habitat only mildly irked me because hey, beggars can't be choosers! Then it was officially changed to "lizard". Artwork by Anson Maddocks. As a paleontology nut who is very much engrossed in evolution and taxonomy, referring to a dinosaur as a lizard was painful. But it didn't stop me! I spent weeks and weeks hunting down all the creatures I could find that were based on dinosaurs, despite them officially being classed as lizards or beasts, and finally put together my very own dinosaur deck! It's clearly a dinosaur given it was made in the nineties (when feathers were still not widely known on dromaeosaurs). It's even called "raptor"! Nope. lizard. Artwork by Bob Eggleton. Gonna be honest, this deck was by no means my strongest. In fact, it lost more games than it won simply because what I wanted it to do was going against what the game wanted to do at the time. I was focused on the flavor of the deck rather than the effectiveness. If dinosaur had been an effective type I wouldn't have had to sacrifice and limited myself in the way that I did since Magic does have cards meant for decks where all the creatures are the same type...but that wasn't the case here, despite what the illustrations showed. I was so convinced this Hystrodon (labeled "beast") was meant to be a stylized nodosaur of some kind. Looking back maybe it was really supposed to be a giant pengolin...hmm. I may have been wrong about that one. Artwork by Anthony S. Waters. That is until this year. 2017 was the year of the magic set, called Ixalan, taking place on a mysterious tropical island, inhabited by...dinosaurs. Actual official dinosaurs! Not only that, but all the lizard and beast cards that were clearly dinosaurs from before, were officially changed to dinosaurs, too! Nerd Chris was very happy. "Magic is finally adding dinosaurs officially! I hope they have feathe- oh...oh wow..." Artwork by Simon Dominic. 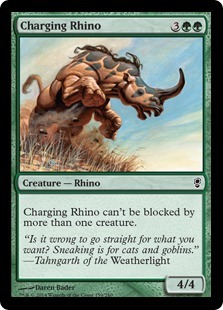 All you pulling the "They do realistic living animals why not extinct ones" card (no pun intended) this is a rhino. Sit down. So why didn't Wizards of the Coast simply just stick to science? To answer this question we need to look into the flavor and story behind the game. You see, Magic is a franchise that takes place over many universes, or planes, as they call them. A creature on one card, within the context of the story, might never meet nor have heard of a creature in another card. This gives the designers freedom from being bound to a specific style or look for years and years. For instance, a goblin from the Dominarian plane is green-skinned with pointy ears and a big nose, while a goblin from Kamigawan plane would have red skin, with a wide mouth and a bumpy shell on the back. They're both different versions of the same type of creature. They just vary depending on where they're from. Like I said earlier, dinonsaurs had been in Magic before. (they just weren't called dinosaurs) Those earlier dinosaurs were pretty typical in design for a fantasy franchise. Scaly...green...and not particularly accurate. The developers at Magic knew the official release of the dinosaur type would be a big deal. They wanted to make the dinosaurs honor our current scientific understanding, but they also had to make these dinosaurs their own. The plane of Ixalan is not our universe. None of the dinosaurs featured are named after real genus, like Tyrannosaurus, and Deinonychus. Instead, Ixalan has dinosaurs like Regisaurus and Ferocidon, to name a few. So flavor-wise, a real genus of dinosaur wouldn't belong there, anyway. Design wise, they decided to make it a requirement that all dinosaurs from this set to have bright feathers. This ensures that when you look at a dinosaur card from Ixalan, you instantly know it is from Ixalan, and not another plane. Just like you can tell a Dominarian goblin from a Kamigawan one. This is also nodding at the fact that we now know many real kinds of dinosaurs were feathered, and is in stark contrast to most other fantasy franchises that feature dinosaurs, which take many steps backwards in their design choices, by making them completely scaly. The folks over at Magic headquarters weren't being ignorant, they knew exactly what they were doing for the sake of the game, but still wanted to let us know they did their science homework by implementing it where they could. I respect that. A toothed Pteranodon-ish pterosaur with bird feathers. And all the science fanboys' heads exploded. Artwork by Simon Dominic. Pterosaurs are included, as well, but they are typed as dinosaurs. Before you start ranting about how "those people don't even know the difference!" There was actually an article written about exactly this on Magic's official site, by head developer, Mark Rosewater. What he had to say regarding this is quoted below.
" It was pointed out very early on when we made flying Dinosaurs that labeling them Dinosaurs was scientifically inaccurate. Making the flying "Dinosaurs" something other than Dinosaurs hurt the gameplay. Tribal play revolves around the creatures in your deck all being the same creature type, so taking away the creature type limits options for the tribe. Most people think of things like pterosaurs as dinosaurs. Before the Wikipedia article states that they aren't dinosaurs, it claims "pterosaurs are often referred to in the popular media and by the general public as 'flying dinosaurs.'" This means that if we made them something other than Dinosaurs, we'd get a lot of complaints because the majority of people believe they are Dinosaurs. So we were in a rough spot. Call them Dinosaurs and we get complaints for being scientifically inaccurate, or don't call them Dinosaurs and we upset an even larger share of the audience and hurt the gameplay. " The reason why they ultimately decided to type the pterosaurs as "dinosaurs" is the same reason why my old dinosaur deck, which wasn't officially a dinosaur deck, kept losing games. Having creatures of the same type within one deck, called "tribal", is beneficial. By splitting pterosaurs off into their own type, it would make both dinosaurs and pterosaurs less playable. Since, again, this isn't earth and these aren't real dinosaurs, it is passable. It wasn't a matter of ignorance, it was a difficult call that had to be made for the sake of the game. I respect that, too. Plus, some of their flying designs look more like actual flying theropod dinosaurs than a pterosaurs. Maybe this was done on purpose? On top of this some of the designs are actually pretty much spot on, scientifically anyway! Science fans are quick to complain about Many of the artworks that are clearly stylized and somehow miss the ones that could easily pass for serious paleoart, going off the dinosaurs, alone. 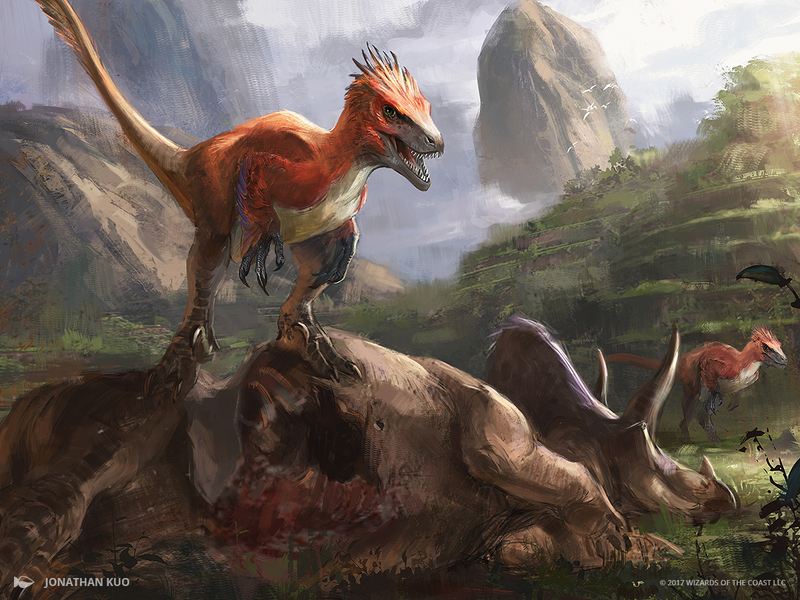 Artist, Jonathan Kuo, knows how to illustrate real dinosaurs. Also by Jonathan Kuo. Just take the armor off, maybe dull the colors a bit, and you've got yourself a scientifically accurate Tyrannosaurus! If you couldn't tell by this point I am totally behind Magic's choice to finally embrace dinosaurs as an official creature type in the game, excessive feathers and all. 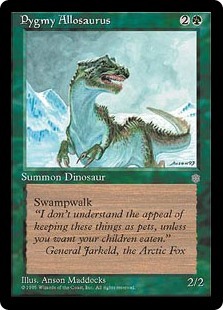 I, for one, already have my new and improved, official dinosaur deck ready to go for the next tournament near my home. What do you think? Was it wise to sacrifice some accuracy for the sake of the game? 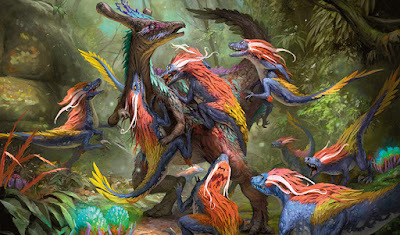 Should all the dinosaurs have just been retro-styled with no feathers instead? Share in the comments below! I actually like that Ixalan has fantasy versions of dinosaurs instead of more scientifically accurate or classic scaly pop-culture ones. A lot of fantasy worlds that feature prehistoric beasts treat unmodified dinosaurs as fantastical beasts in and of themselves. 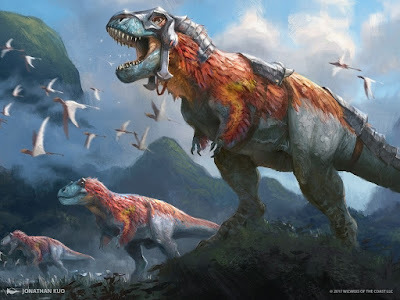 I feel like Magic’s stylistic choice is acknowledging that dinosaurs were actual flesh-and-blood animals and the Ixalan species are magical variations on them. After all, plenty of other real world animals get magical counterparts. Unicorns and Pegasi are fantasy horses. Griffons are magical lions/hawks. Even dragons are, in essence, magical versions of snakes and lizards. Heck- elves, dwarves, trolls, giants, kithkin (the M:TG version of Hobbits/Halflings) and other humanoids are just magical versions of humans. Magic even has a couple fantastic versions of Mammoths and Mastodons (which I am particularly pleased by since American Mastodons don’t get nearly as much attention as Mammoths). So why shouldn’t dinosaurs get their own magical counterparts? While the scientific side of me does cringe at the inclusion of pterosaurs with the “dinosaur” creature label, I totally get why they did it to better facilitate game play and to acknowledge the pop culture view of pterosaurs.